Featuring an all-new line-up of original plays including the world premiere of All About Eves. Merry Ex-Mas: The ultimate in family politics. Silver and Gold: A comedy of Olympic proportions. Hi, My Name Is Carol: Can you handle the stress of the holidays? Holiday Leftovers: All's fair in love and holidays. 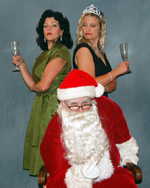 Triple Xmas: It's more than a question of naughty and nice. Outlet: Drama at a discount.